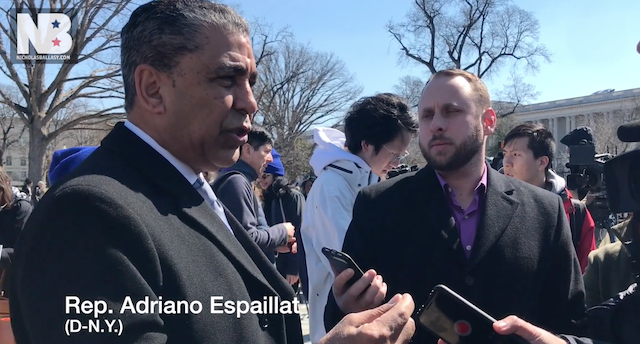 Dem Rep Adriano Espaillat said there is no emergency on the southern border and Pres Trump’s declaration is a farce. The truckloads of illegal drugs and weapons, human trafficking (where Texas BP snagged 400+ illegals in the span of 5 min) is nothing but a figment of our imagination, because the real emergency is protecting DREAMers. Had our immigration laws been enforced we wouldn’t have this alleged “emergency” for DREAMers as they, their families and 20mil other illegals wouldn’t be in the US right now! The only reason democrats want to “protect” DREAMers is because they’re using them to gain power and control. The dems couldn’t careless about these kids, nor their parents, all they see is new voters so long as they continue to pander to them. The Black community is quickly waking up to this abuse and use by the dems, it would be nice if illegals and their kids could see they’re headed on the same path.